Few deaths have caused as much political upheaval as that of King Robert Baratheon. When he passed, the land of Westeros was plunged into chaos, leading to all-out war. Many different families claim to have the right to the Iron Throne, and they are willing to go to great lengths to take their place upon it. Some armies rely on their pure strength of numbers, others have vast wealth at their disposal, and some must rely on their cunning to win the day. 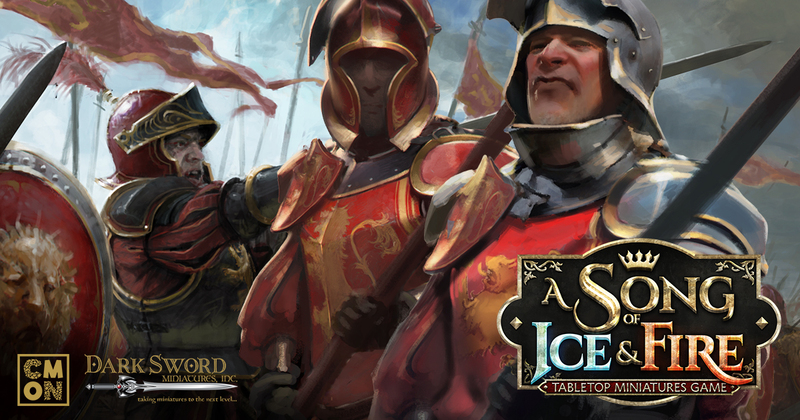 In A Song of Ice and Fire: Tabletop Miniatures Game (ASOIF:TMG), you have to know the different strengths your army possesses and take advantage of them on the battlefield. An army is broken up into different Combat and Non-Combat Units (CUs and NCUs), all with their own specific stats. Combat Unit Cards provide all the information one might need for their specific CU of choice. Everything you need to know about it is contained on this card: no need to reference books, sheets, or anything else. Combat Unit Cards streamline the game, making each engagement a true test of your military prowess. Speed: This shows how far a CU can move in a given action. Defense: This shows how good the Unit is at fending off enemy Attacks. When a CU is Attacked, for each Hit it suffers, it will roll 1 Defense die. For each number meeting this value, a Hit is negated. Morale:  This represents how well a CU can keep its composure under pressure, whether that be getting Attacked by an enemy or suffering other dubious effects. When a CU tests its Morale, it will roll 2d6, needing to meet or exceed its Morale value. Next, we have a CU’s Attack Profile. The first number displays the CU’s To Hit value. When it Attacks, each die rolled that equals or exceeds this number is a Hit. Next to that, we see three values that represent the fighting capabilities of the CU based on its remaining Ranks. In ASOIF:TMG, a CU’s combat potential degrades over time as it suffers damage. Infantry Units are comprised of three Ranks of Troops; as they lose Ranks from suffering casualties, the number of Attack dice they roll diminishes as well. Usually, CUs will begin to lose dice immediately upon losing even one Rank, but as we see with the Halberdiers, they won’t lose dice until they are damaged down to only one remaining Rank, evidence of their weapons and training. However, when they are reduced to a single Rank, they take a major hit to their combat potential. Finally, we come to a CU’s Special Abilities, which are listed in the boxes on the right side of its CU Card. Each Special Ability is unique, but as mentioned earlier, the entirety of its rules are listed on the card. Special Abilities are passive effects and always available to the CU. Sometimes you’ll see an icon attached to the Ability; this is used as a quick-reference to show when the Ability in question is used. In the case of the Halberdiers, their Attack can cut through even the heaviest of armor. This is represented by the Sundering Special Ability, and since it’s linked to their Attack, you have the Weapon icon next to it to remind you! Success or failure on the battlefield often comes down to the ability to react quickly to an opponent’s actions. Combat Unit Cards in ASOIF:TMG put all the information about those troops in your hand and in an easy-to-reference format. They allow you to focus on the fight you’re engaged in, rather than looking up rules. Step into the role of one of the great leaders in the War of the Five Kings and battle your way to victory. ASOIF:TMG is coming to Kickstarter in July 2017. Read the Introduction to ASOIF:TMG  here. Read the ASOIF:TMG - The Beginning article here. Read the ASOIF:TMG - Design and Development article here.